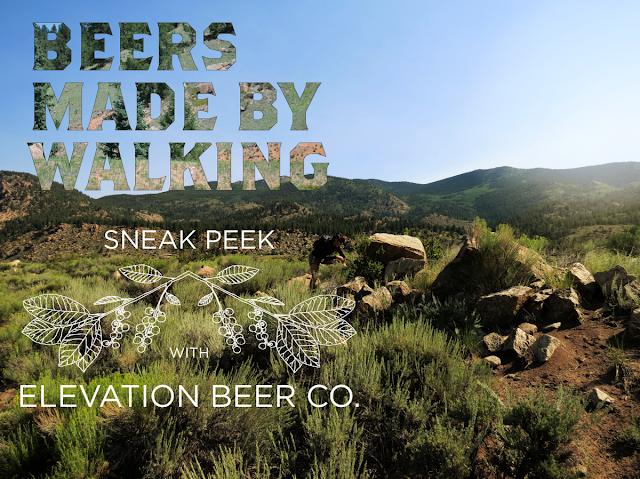 Beers Made By Walking: Sneak Peek #02 - Elevation Beer Co. Sneak Peek #02 - Elevation Beer Co. Continuing our behind-the-scenes series of the beers you will try at the coming Beers Made By Walking festival in Denver, our next preview comes from Elevation Beer Co. Their beer, along with 16 others, have gained their inspiration from the Rocky Mountain landscape and will be available for one night only on October 8th at Wynkoop Brewing in Denver. Elevation is located in the heart of the Rocky Mountains, in Poncha Springs, just a few minutes from the town of Salida, and a short drive to some excellent skiing at Monarch Mountain. The brewery boasts one of the highest altitude brewing facilities in the world, sitting at around 7,465 feet above sea level. They are also a relatively new brewery, having started their operation in March of 2012. Elevation was eager to be a part of Beers Made By Walking when they heard about it because their brewery team thoroughly enjoys hiking trails and outdoor mountain activities. The challenge of the Beers Made By Walking program is to go on a hike and let the plants on the trail inspire you to make a new beer. In this way, the beer takes on a character that is very local, it is a portrait of the place where the brewery resides. Elevation's hike took place just east of the Arkansas River in Chaffee County. They discovered that during the height of the season, red currants grow plentiful in the region. This berry is known for it's beautiful balance of sweetness and tartness, and it is loaded with Vitamin C. The berry belongs to the genus Ribes, and ribes has been used as a descriptor characteristic for beer that has aged for some time and has picked up sweetness and subtle musk. In their journey to find the berries and decide on a beer style, Elevation consulted several edible plant experts to find the perfect ingredient to represent the high country. "We thought red currants would provide a complementary fruit flavor to a heavily hopped blonde ale. We did not want specialty grains to be competing with the flavor of the hops and berries so we chose to brew a very light, very simple base beer. We picked the berries along the banks of the Arkansas River near the famous "Numbers" series of rapids. We decided to give the berries a special treat before brewing and strapped the bucket of berries into a raft and ran the famous stretch of river. Several members of the production staff went swimming (not by choice! ), but no berries were harmed." The name of this highly-hopped Red Currant beer is "Last Run." You'll be able to try this beer, along with 16 other beers made specifically for the BMBW event on October 8th in Denver. This special event is a fundraiser for Denver's Cottonwood Institute, which provides environmental leadership opportunities for youth in Colorado. We're really looking forward to this beer and hope to see you there! Also, please stay tuned for more sneak peeks! You can get updates via email, you can join us on Facebook and on Twitter. Also, connect with Elevation Beer on Facebook if you haven't already. See you on October 8th!